This semester at Cumberland University, I taught History of American Music, which is the proper name for the School of Rock. I started with the music that inspired the early Rock n’ Roll stars and followed the evolution of that genre through the decades. We covered everything. 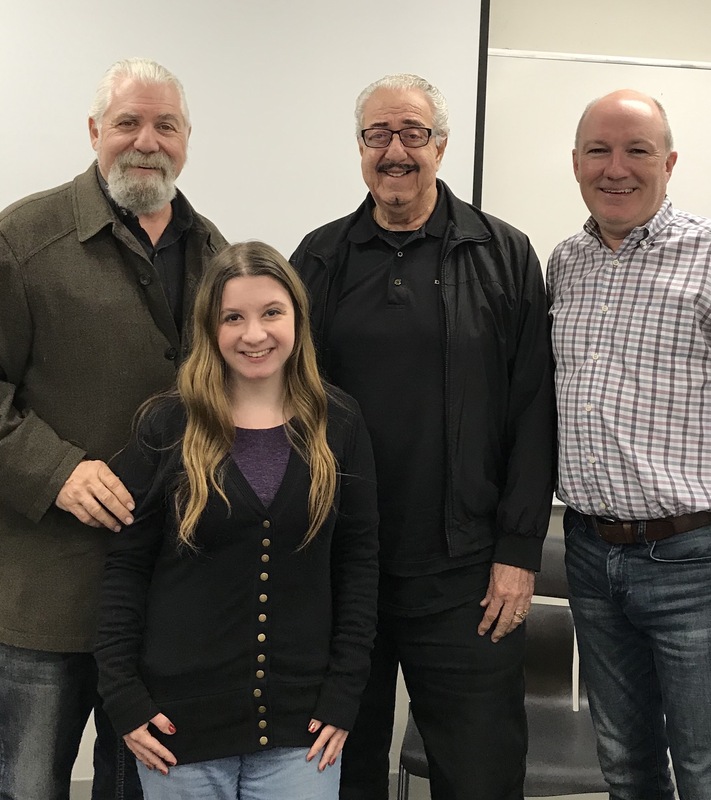 At the end of several classes, Michaela, one of my best students, said that her dad and granddad knew who we had discussed. At some point, I said that they needed to talk to the class. Well, a few weeks ago they did just that and told a lot of amazing stories. Her grandfather Jerry Marcellino has had an amazing career. He began as a musician and was the opening act for a lot of established artists. Heck, he was on tour with Jerry Lee Lewis when the world found out that he was married to his 13-year-old cousin. Jerry’s career as a musician did not work out, but he made his way into producing and songwriting. This began with his relationship with members of Herb Alpert’s Tijuana Brass and continued until he worked for Berry Gordy at Motown. In that job, he worked with Michael Jackson, The Supremes, The Four Tops, Smokey Robinson and The Commodores. The students really like his stories about Michael Jackson. They used to draw cartoons and trade with each other during recording breaks. Michael also pranked called Jerry, but he always knew it was Michael. Michaela’s dad Yochanan Marcellino grew up around all of those people and eventually made his way into the musical profession as a manager. Through the years, he worked with Kansas, Jose Feliciano, Chaka Kahn, Lou Rawls and the Captain and Tennille. He is now a movie producer and is working on a film about Rocky Marciano. However, they are not the only Marcellinos who have made an impact in the music business. Muzzy Marcellino was a fantastic whistler who whistled for John Wayne in The High and the Mighty and who can be heard whistling in Hugo Montenegro’s version of the The Good, the Bad and the Ugly theme. Jocko Marcellino was an original member of Sha Na Na and performed at Woodstock. Dennis Marcellino was a member of Sly and the Family Stone. Vince Guaraldi, whose mother was a Marcellino, wrote themes for the Peanuts cartoons. In short, Michaela’s family lived the storied that I had been telling in class all semester. It was a true honor to meet them and have them talk to my class. Every so often, our city honors a person who has been a business leader and civic leader in our community with the Legends of Lebanon Award. Last week, that award was given to my dad. It was a great night. He was thrilled, and the entire family could not have been prouder. Charles Bell was born in Saulsbury, a community in eastern Wilson County, and grew up on the dairy farm owned by his parents Albert and Pauline Bell. During his childhood, there was no electricity or indoor plumbing, but his parents and his extended family, which included Uncle Chester and Aunt Selma Bell, instilled in him the importance of hard work. During the summers, Charles sold walnuts; counted cars for the state; measured tobacco; and showed his work ethic in various other jobs. Charles graduated from Watertown High School, where he played football, and moved to Lebanon when he married Elaine Vanhook. He tried a few jobs but found his calling with the help of his father-in-law J.W. Vanhook. Together, they invested in a business to assemble storm doors and storm windows and sell them door-to-door. From there, Charles formed Lebanon Aluminum Company, known as Le-Al-Co, which he owned and operated for 30 years. Under his leadership and salesmanship, the company grew to employ 400 people and have its products sold in 49 states and Great Britain. Windows and doors manufactured in Lebanon filled the shelves of Home Depot, K-Mart, J.C. Penny and regional hardware chains throughout the country. Charles also founded Bell Door Company, which produced wooden doors. After several years of operation, he sold the business to Steves and Sons, which has maintained a manufacturing facility in Lebanon since the 1970s and continues to employ over 100 people. Charles’ business ventures have not been limited to manufacturing. He served on the Board of Directors of Heritage Federal Bank, a Kingsport-based bank that had a branch in Lebanon. He was also one of the founders and served on the Board of Directors of Wilson Bank and Trust, which is now one of Lebanon’s largest employers. In addition, he was one of the founders of The Wilson World newspaper, which is now known as The Wilson Post. Through the years, Charles has believed in serving his community. This began as a member of the Lebanon Jaycees, an organization that led projects such as the building of the Lebanon High School football stadium, which is now the Cumberland University football stadium. In 1968, Charles was elected President of the Tennessee Jaycees, and, in 1969, he was elected Vice-President of the United States Jaycees. That same year, he was honored as one of Tennessee’s Outstanding Young Men. When his time in the Jaycees was done, Charles continued to serve in various ways. He is a 33rd Degree Scottish Rite Mason and a member of Shriners International. He served on the Governor’s Cabinet as Commissioner of General Services for the State of Tennessee. He has served on the Board of Trust of Cumberland University and the Belmont University Board of Trust. 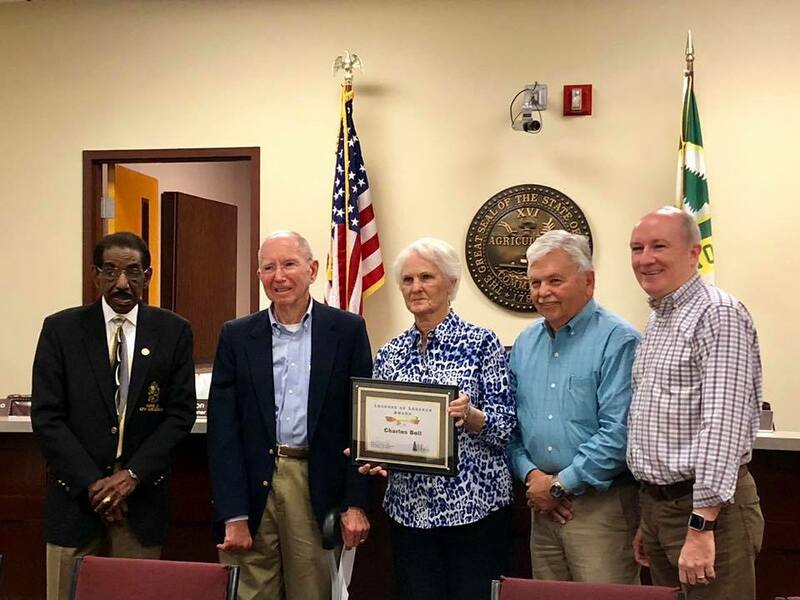 For many years, he was a member of the Wilson County Water Authority Board. A long-time member of Lebanon’s First Baptist Church, Charles has also served the church in many capacities, including Deacon. Charles has also found time to invest in recreational activities. Never forgetting his time growing up on a farm, he has retained his love for agriculture and created Horn Springs Angus Farms. Through an extensive breeding program, his stock became the highest ranked angus herd in Tennessee and one of the best in the country. During Charles’ time as owner of Horn Springs Angus, cattlemen from throughout the nation traveled to Lebanon to attend the annual production sale. For almost 25 years, Charles sponsored the Le-Al-Co Storms, a men’s slow pitch softball team that competed in the highest levels of the sport. They won 10 state championships and finished as the second ranked team in the nation in 1991. In 2010, Charles was inducted into the Tennessee Softball Hall of Fame as the sponsor with the most state championships and most wins in Tennessee history. In 1991, Charles suffered a massive cerebral hemorrhage while attending a meeting in Kingsport, Tennessee. He was 53 years old. Doctors gave him little chance to live and, if he lived, they believed he would be bed-ridden. With the determination and work ethic he displayed in business and community service, Charles went through years of rehabilitation to beat the odds. He proved the doctors wrong and continued his work with Wilson Bank and Trust and his cattle operation. He also continued to provide a strong foundation for his growing family. Charles and Elaine have two sons. Jack and his wife Meleia have two sons, Weston and Bronson. Rick and his wife Necole have one daughter, Isabella. Through everything he has done, Charles’ greatest accomplishment has been a loving husband, father and grandfather. A few weeks ago, our friend Steve invited me to attend a historic lecture at the Nashville Public Library. Being someone who gives historic lectures every day, I was fired up to have the opportunity to hear someone else do it. I was especially fired up to hear Nathaniel Philbrick, the person who was speaking. Last Monday, was the big night to hear some interesting stories, but the history began before the lecture. We had dinner at Woolworth on Fifth, a new Nashville restaurant that has an old story. It is named for Woolworth Five and Dime, which was in the same location for decades. Those stores were famous for their shopping but became infamous for their lunch counters. Those of you who know Civil Rights history probably realize that the first lunch counter protests took place in Greensboro, North Carolina. African-American students sat at the segregated lunch counters as a way to fight against the injustice. However, you may not know that lunch counter protests were supposed to happen in Nashville first. Students from Fisk University and Tennessee A and I trained for months to carry out the protests. While they were training, the students in Greensboro just decided to do it. That did not stop the Nashville protests. Rip Patton, John Lewis and others completed their mission to much abuse. In fact, it is the first time that Lewis ever got arrested. Woolworth on Fifth has rebuilt the lunch counter and honors those brave people by telling their story. 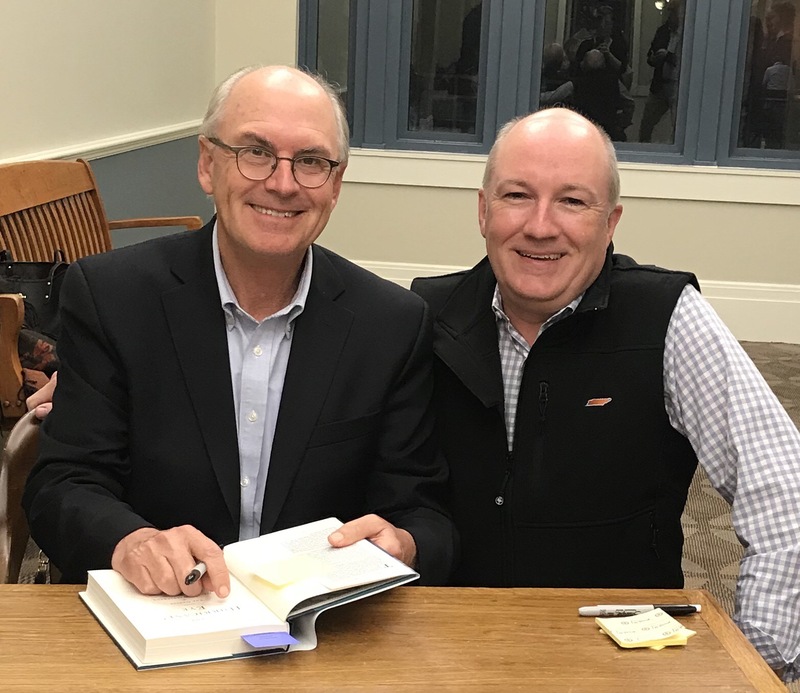 After dinner, we walked to the library to hear Philbrick talk about his latest book, “In the Hurricane’s Eye: The Genius of George Washington and the Victory at Yorktown”. It is the last of his American Revolution trilogy. I have yet to read those, but I have read “In the Heart of the Sea: The Tragedy of the Whaleship Essex” and “The Last Stand: Custer, Sitting Bull and the Battle of Little Bighorn”. After the lecture, we had the chance to meet Philbrick and get books signed. At this point, I told him that have assigned “In the Heart of the Sea” to my freshman classes for years and have sold hundreds of copies. Like a good historian, he was appreciative of that. 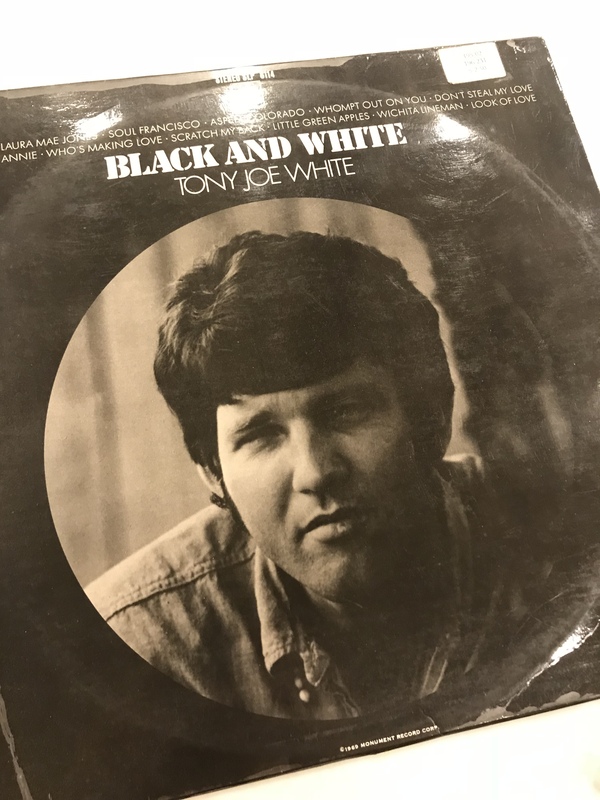 A few days ago, Tony Joe White passed away at his home, which is in a community not far from here. He never became a solo star, but a few of his songs are well-known. “Polk Salad Annie” became one of Elvis’ regular songs at concerts, and “Rainy Night in Georgia” skyrocketed for Brook Benton. However, neither of those performers could sing the songs like Tony Joe White could sing them. I am currently listening to his 1969 debut album Black and White. After its release, many thought that he would hit it big, but that never happened. It is a shame because he was a great singer who had the style and the talent that many who make it to the top do not possess. He wrote songs with deep meaning, which may have been too much for popular radio. He also had a Swamp Rock style that may not have been in tune with everyone’s ears. However, it is great music. Everyone has performers who they wish they could have seen live. Tony Joe White is at the top of my list. With him living nearby, there were probably chances that I missed, and that is a regret. If you get a chance, then go to YouTube and check out his work. It is true art. The whistling of the wind. The rustling of the leaves. The lowing of the cattle. 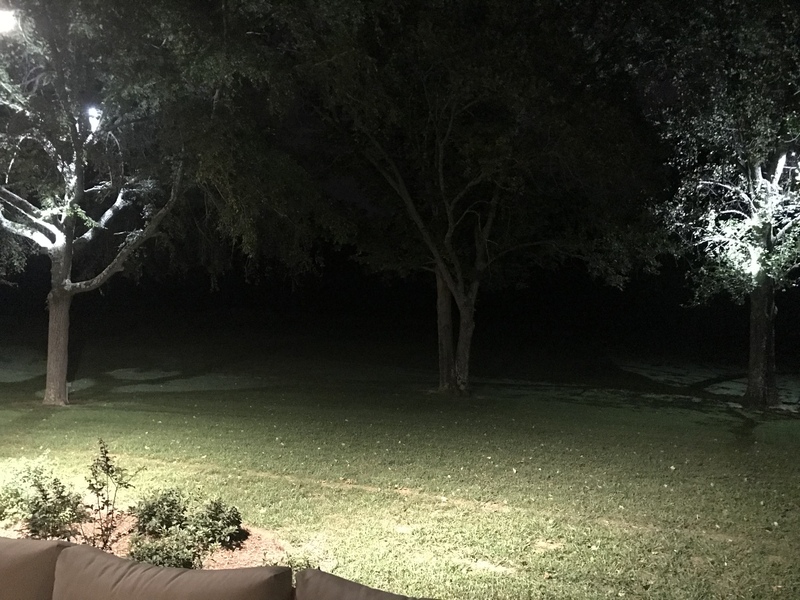 The chirping of the crickets. The roaring of cars on the distant highway. The patter of Daisy’s paws. The thumping of the music from inside the house. The clicking of the keyboard. Those are the sounds of the night on our back porch. Today, we dined at one of our favorite brunch places in Nashville, and I posted about it on Facebook. Yes, I broke down and joined the Facebook universe after fighting it for years. This means that I now have a Facebook account; three Twitter accounts; and this blog. Hopefully, all of that will not lead to a social media meltdown. Anyway, the discussion that ensued brought to mind a potential blog post. What, in my humble opinion, are the best appetizers in Nashville, a place that has become known as a foodie locale? For those who may not know, I once wrote a post about the oddity of appetizers. Since this is my second post about appetizers, then that must qualify me as an appetizer expert. With that in mind, here is my list of the top five appetizers in Nashville. 5. The Charcuterie Platter at Urban Grub – On the surface, charcuterie platters seem simple. There is a little cheese. There is a little meat. There are a few crackers. However, not a charcuterie platters are made equal. Urban Grub brings out a slab of wood topped with a variety of house cured meats and distinctive cheeses. The Creole mustard is what really sets it off. Unfortunately, the Creole mustard ended up on the floor during my first platter experience. That is another story for another time. 4. My Way at The Southern – This is more than an appetizer. It is an explosion of flavor. It is like someone put a dance club on your plate. It is an appetizer. It is a meal. Heck, it can also be dessert. I will just let the menu describe it. My Way is brown butter linguine topped with pine nuts, goat cheese, bacon lardons and two fried Willow Farm eggs. 3. Roasted Garlic Tallow Candle with Monkey Bread at Fort Louise – We were looking for a new dining experience, and I stumbled upon Fort Louise while browsing the Internet. On the night of our dining experience, we were not sure about it. We pulled up to an old house and wondered if it was the right place. There was no sign, and the restaurant next door was packed. When we walked in, there we a few other diners who would fit the mold of millennials. Of course, Nashville is filled with millennials. They live cool lifestyles and eat cool food, but none of us can figure out how they afford it. I say that to say that we were the oldest people there. However, youthful vigor returned when we were served our appetizer. The tallow is burning, and the monkey bread is meant to be dipped into the melting candle. Fat has never tasted so good. 2. Cheese Fritters at Amerigo – My absolute favorite food is burnt cheese. You know when you make homemade nachos and part of the cheese is crusted on the pan. That is the cheese that I like. Now, take that cheese; cook it in an orb shape; and place it on a plate of honey mustard and marinara. I am speechless just thinking about it. Wait, I should say that I am typeless just thinking about it. This is the appetizer that inspired my previous post about appetizers. 1. 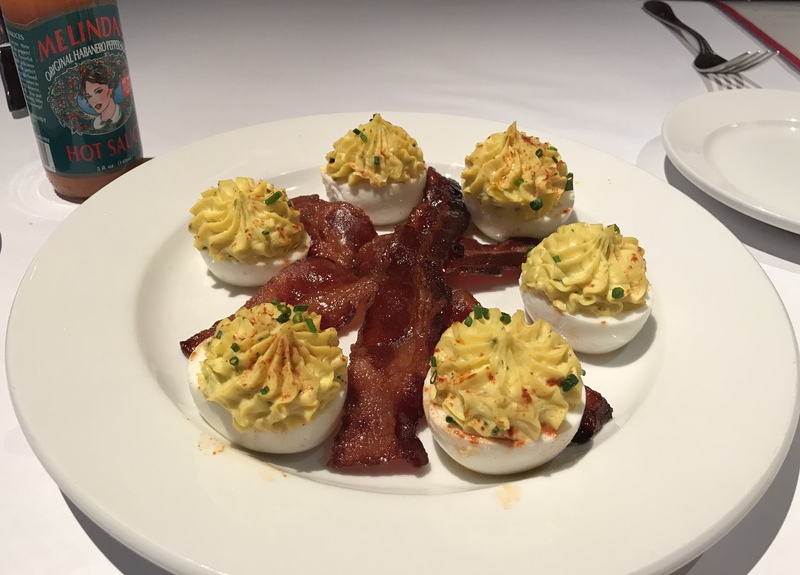 Deviled Eggs and Millionaire’s Bacon at Brick Top’s – Today, we had brunch at Brick Top’s, and we never go there without getting this appetizer. A lot of restaurants in these parts have deviled eggs appetizers, but none of them compare to these. In fact, Brick Top’s may have started the deviled egg trend. These eggs are awesome, but the hot sauce makes them more awesome. That spice also blends well with the bacon that is smothered in a sticky syrup. We always wonder how they make the sweet bacon. In the old days, we knew one of the managers, and he would always slip us some extra eggs and bacon. Now, we just get the regular order, but there is nothing regular about these eggs and bacon. There you have it. My list of the best appetizers in Nashville. If you have dined in the Music City, then what is on your list? A few years ago, I wrote a post inspired by the movies of Burt Reynolds. Upon his passing, I decided to reblog it. A couple of blogging ideas popped into my mind over the weekend, and I decided to smash them together to form a semi-regular series of posts. First, I went on a quick trip to Chattanooga, which isn’t too far away, and crossed Monteagle Mountain along the way. Those not from Tennessee may not know about Monteagle, but it is one of the great spots in our state. It is also where the Bandit gained his notoriety. Don’t know what Bandit I am talking about? Well, there is only one Bandit, and that is the one played by Burt Reynolds in Smokey and the Bandit. 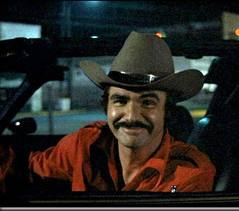 According to the opening song, the Bandit became famous when he safely steered his jack-knifed truck down Monteagle. As I crossed the mountain, I started thinking about a blog of my favorite Burt Reynolds movies. Whatever Happened to Sandahl Bergman? Enter your email address to follow this blog and enter the SBI world.